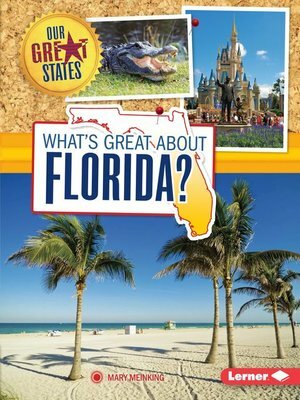 What's so great about Florida? Find out the top ten sites to see or things to do in the Sunshine State! Explore Florida's endless beaches, thrilling theme parks, and stirring history. The Florida by Map feature shows where you'll find all the places covered in the book. A special section provides quick state facts such as the state motto, capital, population, animals, foods, and more. Take a fun-filled tour of all there is to discover in Florida! Mary Meinking is a graphic designer by day and writes and illustrates books for children at night. Her articles have been published in a dozen different children's magazines. She lives in Iowa with her family.